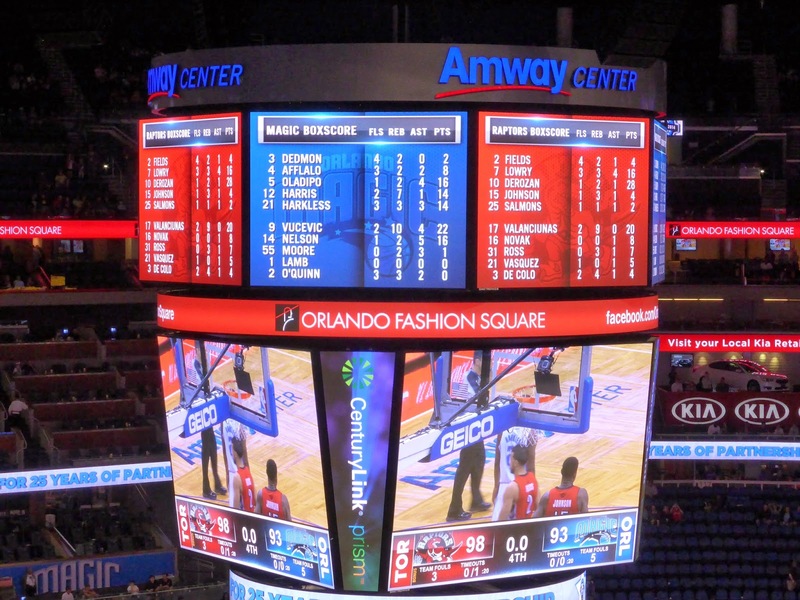 I wanted my final venue visit for Club 122 to involve a Toronto team on the road, and the NBA scheduler obliged by sending the Raptors to Orlando on March 30th. 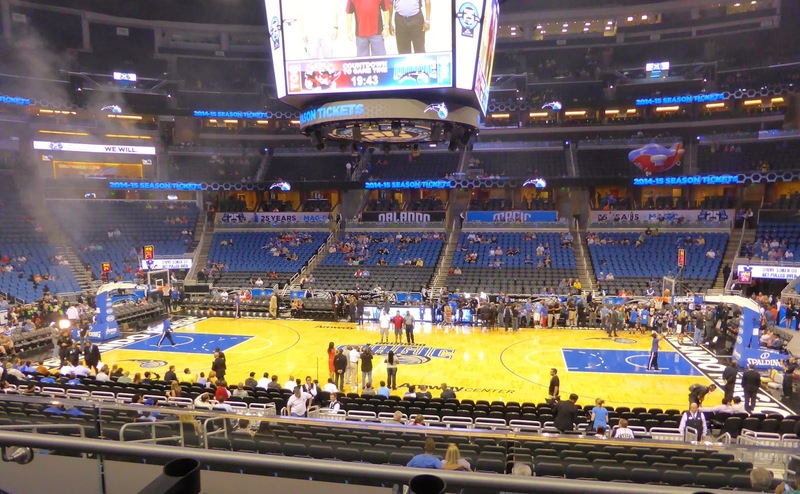 I had visited the Magic back in 2010, but that was during the last season of Amway Arena. My rules of Club 122 stipulate active arenas, although it has been pointed out to me that anybody who sees a game in all Big 4 venues at some point in their lives deserves a membership. Hard to disagree with that, given that so few people have actually accomplished it. And now I am one of them! 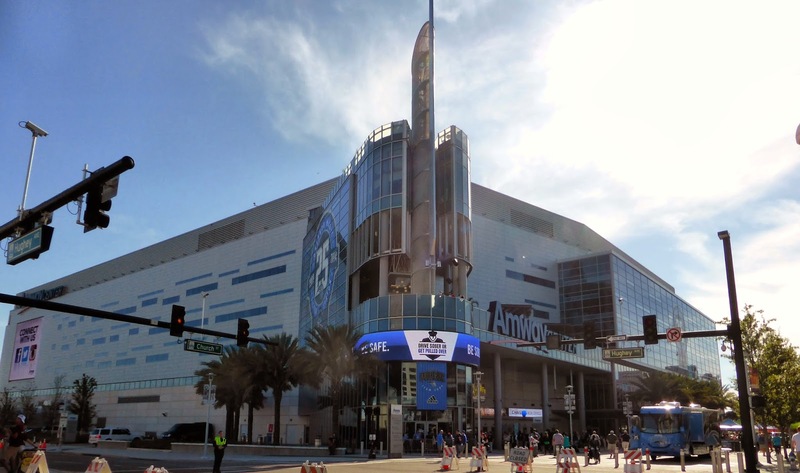 Located at the corner of Church Street and Hughey Avenue right next to I-4, the Amway Center is the centrepiece of Orlando's revitalization plan dubbed Master Plan 3. 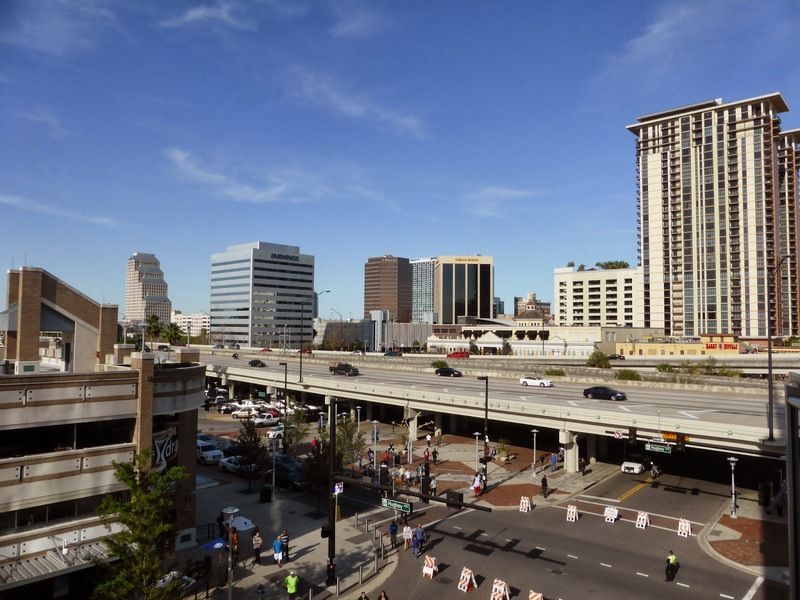 There is a parking garage right next to it sponsored by Geico, but that should be avoided as free street parking is available on Orange Avenue north of Jefferson, about a 10-minute walk away, through a street lined with bars and pubs. The front of the arena is closed off to traffic and a small party plaza is set up. 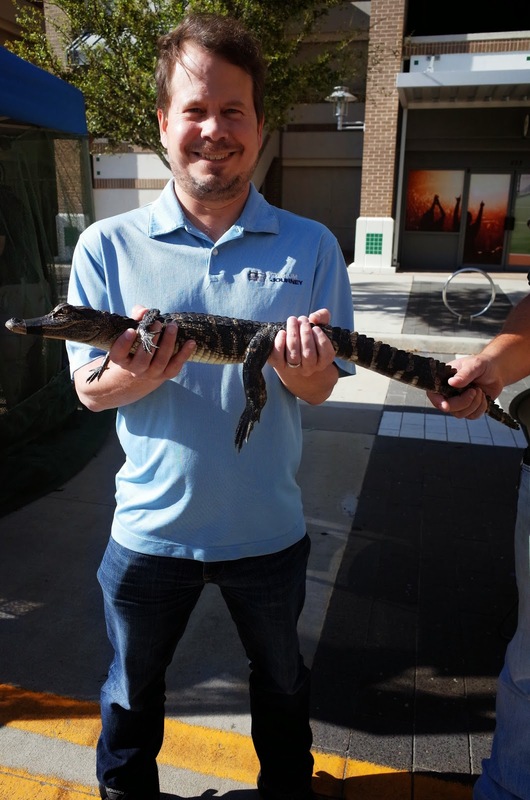 There are a number of Florida-specific displays including one with live animals, such as a baby American alligator that you can hold (above). These creatures will be re-released into the wild once they are rehabilitated; from what I could tell they are generally taken from residential areas and then relocated to their natural surroundings, so this little fellow should be swimming freely in a few weeks. Entering into the Disney Atrium (above), you can take an escalator to the 100 level. If you want food, better to find something here as the upper concourse has fewer options. I did not partake during either of my visits though. There is a guest assistance booth with the designated driver program allowing you to get a free small soda. Judging by the confused look I received when I tried to redeem my coupon, few patrons take advantage of this offer. As you walk around the lower concourse, you might realize that you cannot see any of the floor from most locations. Only at one end does the concourse open up with a view (above). In other cases, you have to walk down a long flight of stairs to reach the seating area, where you will be asked to show your ticket. Mentioning that you are just going to take a photograph will usually allow you a quick pass, but don't loiter. I should mention that having the stairways below the club seats does allow the them and the upper deck to be closer to the floor. 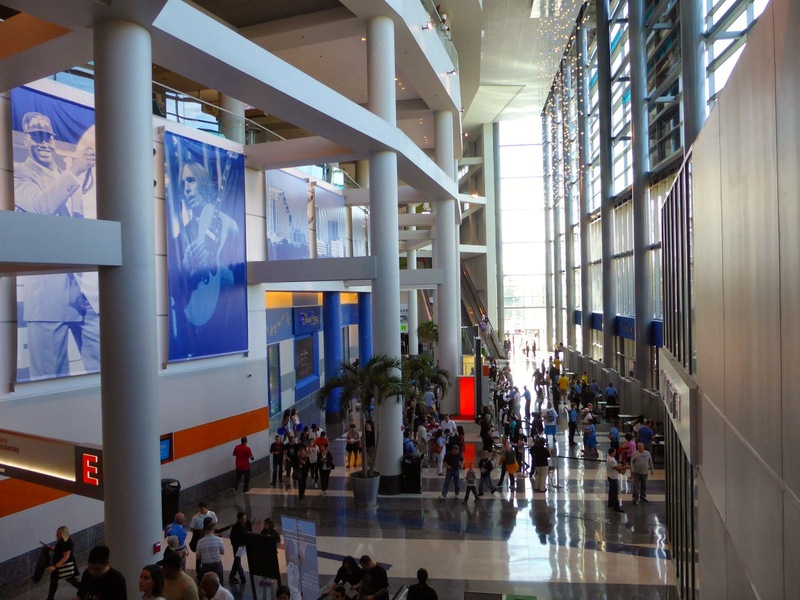 The main weakness of the Amway Arena was its lack of luxury seating and alternative areas, and this has been rectified in the new building, with over 60 suites and 68 loge boxes between the 100 and 200 levels, as well as 14 MVP Tables which seat 4 fans each. Prices for some of these locations are not outrageous if you want a unique experience when visiting the Magic. There were even seats available on TicketMaster the day of the game. Other special areas include 'Ronas and 'Ritas, an outdoor lounge with a view of the highway (below). As mentioned, the upper bowl is actually not that far away from the floor compared to other multi-use venues, the photo below is from my seat in the first row of section 212. The seats in the foreground are part of the Club. 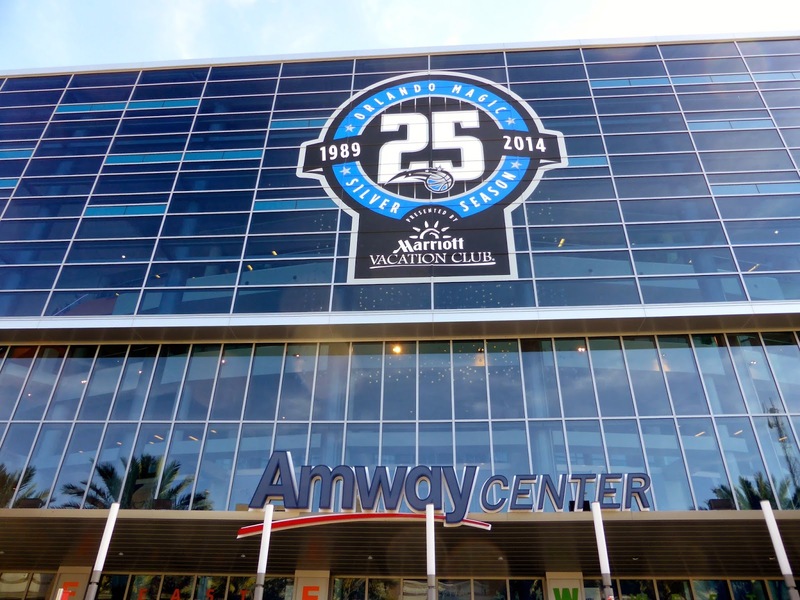 Overall, Amway Center is an excellent venue in terms of design and amenities, and it can be quite affordable as well. Unfortunately the team is struggling and fans are staying away, as you can see above. This lack of atmosphere really hurts the gameday experience and had me yawning at various points throughout the contest. 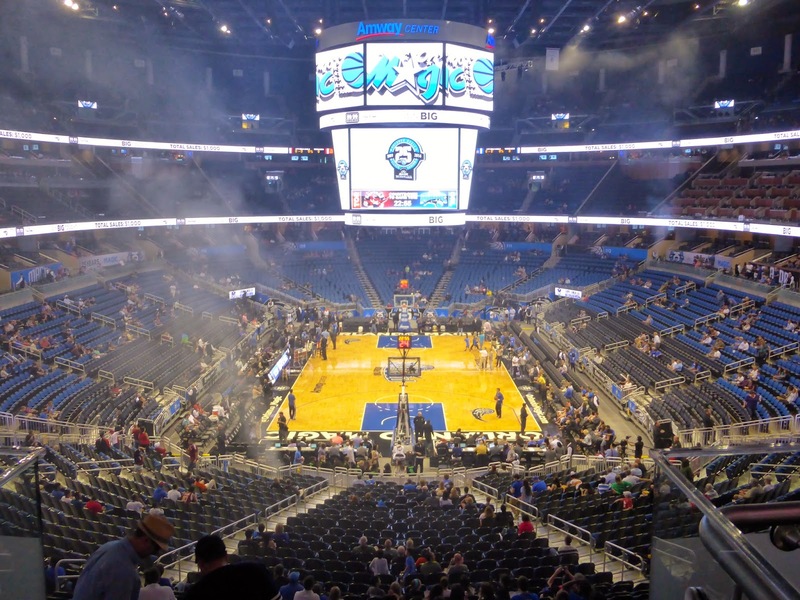 When the Magic return to respectability, I would expect Amway Center to me a more engaging place, but until then, expect a lacklustre affair should you attend. The Raptors had just clinched a playoff spot and I was worried that they wouldn't be too motivated for this one, and they started slowly, falling behind 22-21 late in the first quarter. They then went on a 23-4 run to take a commanding 19-point lead into the half at 57-38. The story of the half was foul shots, as the Raptors committed only 6 infractions compared to 12 for Orlando, which led to 14 Toronto points on perfect free throw shooting. To make matters worse for the Magic, they went 0/7 from beyond the arc. Jonas Valanciunas (below) led the Raptors with 16 points. I fully expected the Magic to mount some sort of comeback as it happens so often in basketball, but I wasn't prepared for what happened. 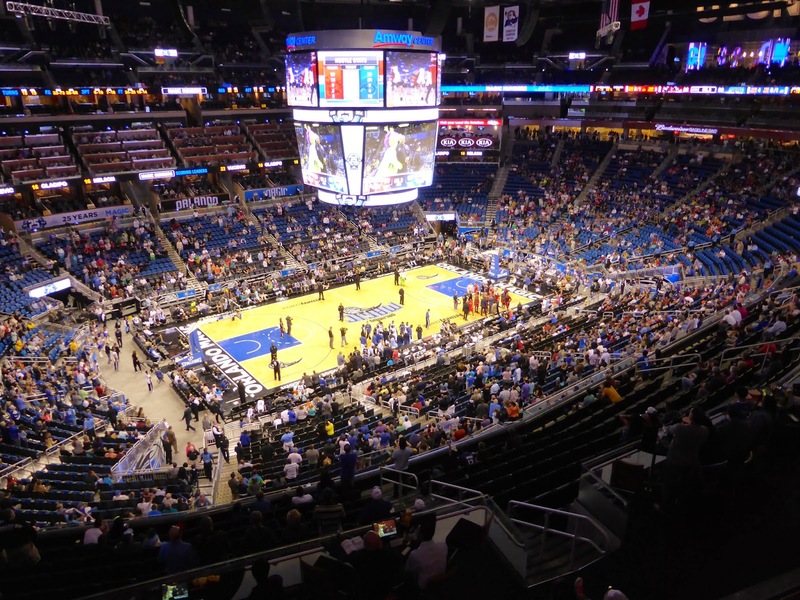 The Magic went 10/15 including 3/4 from downtown to win the 3rd quarter 26-16 and close the gap to 9 points. 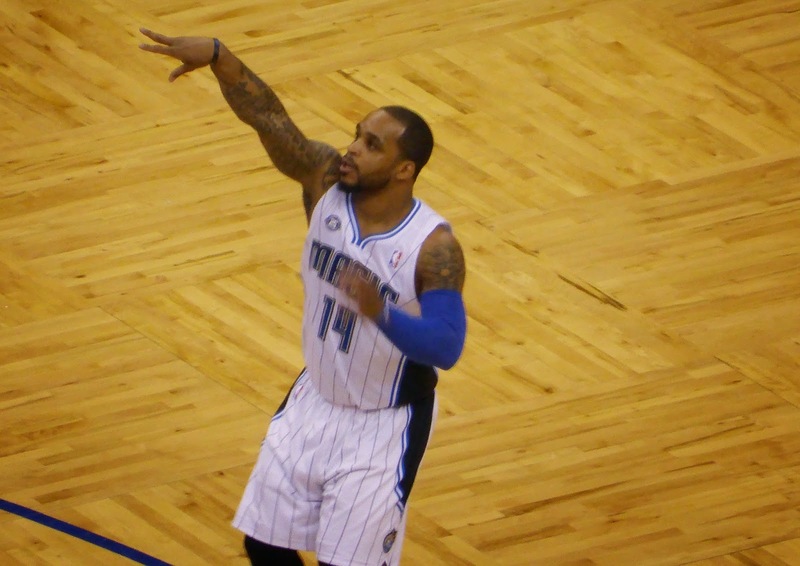 Jameer Nelson (below) led the way with 12 for Orlando. The fourth quarter saw the Magic make 3 quick treys on their way to tying the game at 76. I was furious by now at how Toronto had played without any intensity and allowed one of the worst teams in the league to get back into it. Didn't they know it was my Club 122 game?! 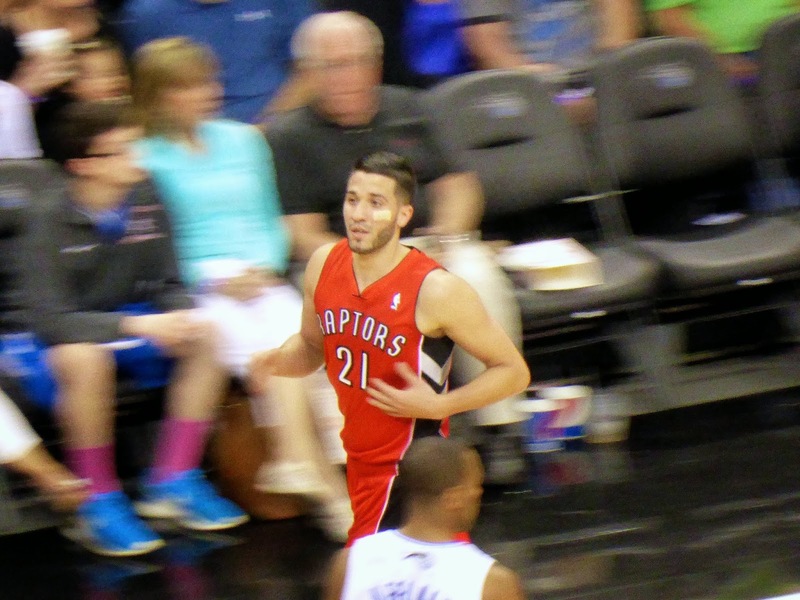 Thankfully, the Raptors woke up and took an 85-80 lead, helped by the Magic finally missing some threes. When DeMar DeRozan sank a couple of free throws (below) to make it 87-80 with five minutes left, I breathed a little easier. Of course, things were not quite over. Of course. Down 93-84, the Magic went on a mini 9-3 run to get within three points with just 30 seconds to go. Kyle Lowry missed a layup and the Magic rebounded and called timeout with just 8.9 seconds on the clock. They would have a single chance to tie the game. Maurice Harkless took the ball on the sideline and looked for an open teammate. The Raptors managed to cover everyone and Harkless failed to pass the ball within the allotted 5 seconds resulting in a turnover. 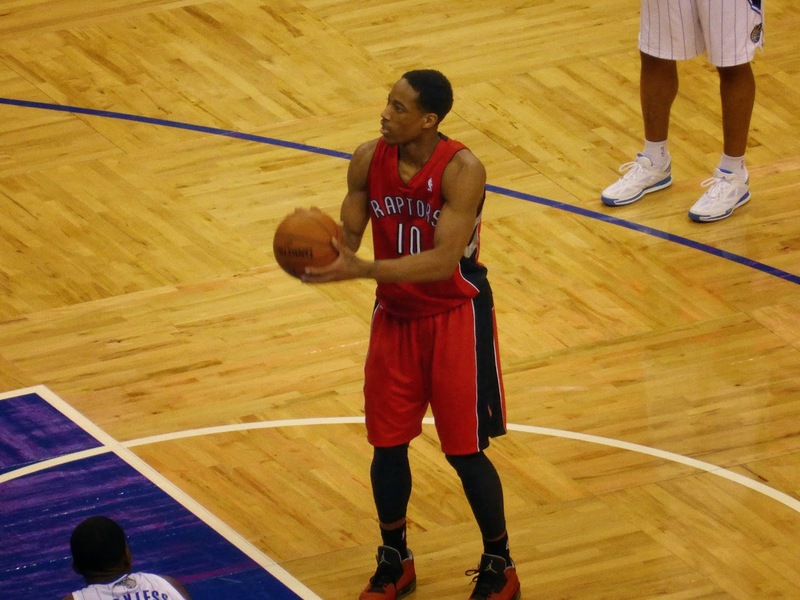 DeRozan was fouled immediately and sank both shots to make the final 98-93. Although the Raptors won, the ending was anticlimactic. I would have much preferred that Orlando take a shot, even if overtime was the result. The referee who made the call, Scott Foster, did the same against the Raptors last season, so perhaps it was fitting after all. DeRozan led all scorers with 28 points, including 15/16 from the charity stripe. Orlando outshot Toronto from the floor 55% to 45%, but Toronto's 26/27 rate from the line earned them the road win. In particular, Orlando played extremely well in the second half, sinking 22 of 33 from the floor, but it was their lack of aggressiveness inside that cost them in the big picture. Interestingly, the game in New Orleans had a similar score, won 98-96 by the Pelicans, but this one was a stinker, with 34 turnovers and generally poor play all around. The media will have you believe that a close basketball game is a good basketball game, but that is not necessarily the case. For me, at least Toronto won, allowing me to celebrate my Club 122 entrance happily. Grevis Vasquez came in off the bench late in the first and received a cut on his cheekbone that required 5 stitches, forcing him out until the second half. He returned and played nearly 15 minutes, finishing with 5 points. That's him below with the bandage on his cheek. The Magic are celebrating their 25th season by winning 25% of their games (28.4% actually but why let reality get in the way of a good joke). 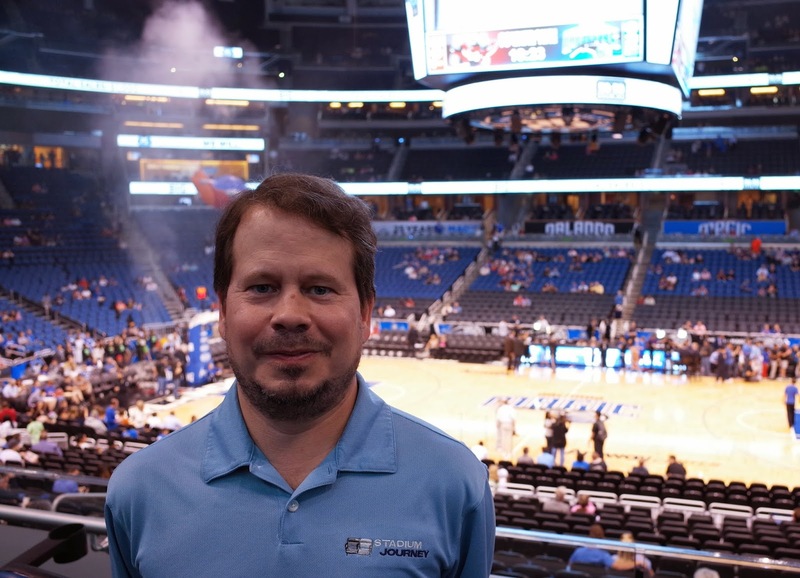 My wife joined me for the game, allowing me to have a good picture taken of myself for a change. She was happy that the Magic scored five three-pointers as all fans get a free sandwich from Chick-Fil-A on Monday. Needless to say, I was not happy, leading to some spirited discussions of how we root for Toronto in this family. Major League Baseball was kind enough to have the Blue Jays open the season in Tampa so I'll be heading there for three games in that series, skipping opening day. Check back on the weekend for a recap.